Apparently, the Pittsburgh Public Schools District Finance Director has had the benefit of a $500,000 post-impressionist painting to hang about the office. We should all be so lucky. One would think that a poster from Walmart might have been more appropriate! It turns out that the painting was purchased in 1933 at a Pittsburgh art exhibition and then it mysteriously disappeared from art circles. 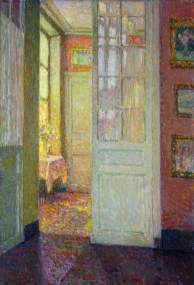 The artist, Henri Le Sidaner, died in 1939. The piece was described in a catalog of art which the District maintained, but no one appreciated the true nature of the artwork until the Carnegie Museum of Art was consulted in the Fall of 2012. Talk about hiding in plain sight! Most parents, we would venture, would nonetheless prefer their kids’ grade school finger painting art. The school district is looking to auction the painting in short order and Sotheby’s may have the inside track for now.